Success! Years of dedicated work climaxed in a two and one-half second trip to the moon and back. For K2UYH his final continent garnered via the joint efforts of fellow amateurs. In preparation for maintenance work, he makes it look easy to bring the multi-ton structure to the horizon. 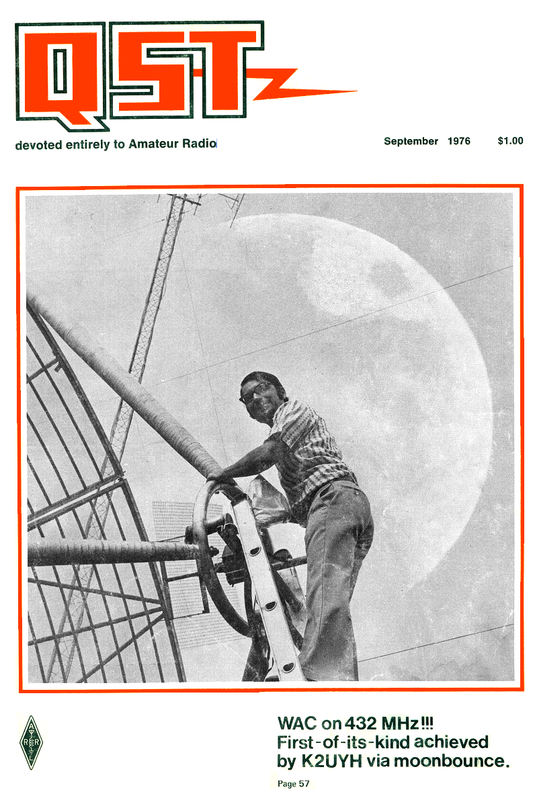 When moonbounce work started in the early sixties, only a handful of radio amateurs tried, and fewer succeeded, because of the tremendous diminishing of signal strength. At 432 MHz, a reflected signal is only a miniscule fraction as strong as when it was originally transmitted. In EME circles this phenomenon is called path-loss obstacle. But with extremely high-gain antennas, efficient feed lines and amateur persistence, the radio art kept advancing until effective systems became readily available. After the latest series of National Radio Laboratories and Stanford Research Institute tests began in the early seventies, interest accelerated among more than 50 vhfers to make EME contacts commonplace, now. Activity dispersed to all corners of the globe, except South America. Early this year, however, the Mt. Airy VHF Club began planning to fill that gap with an expedition into Colombia from their Philadelphia, PA, home. Carefully listening to his receiver to identify the slow, deliberate cw in the noise, Al starts another EME schedule to help a fellow moonbouncer check out a new antenna. Yes, the familiar whoop of a signal going through Doppler shift is there. 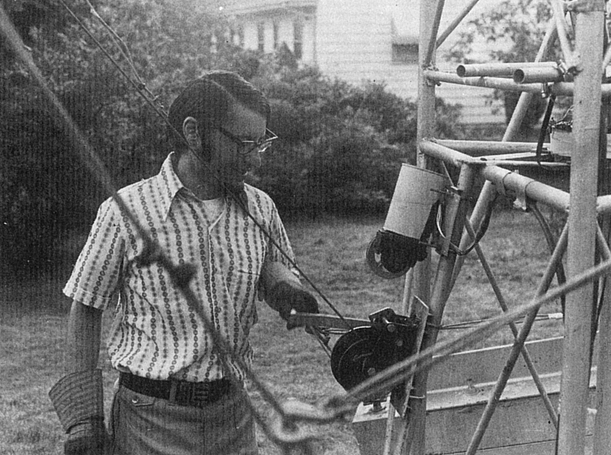 In the backyard of his West Windsor, New Jersey, home a 28-foot diameter dish makes whirring noises as the azimuth, elevation and feed polarization are adjusted to peak the reflected signal. Just a few miles away at Grovers Mill, Orson Welles had imagined large dishes of a sort that were instead occupied by landing Martians in The War of the Worlds more than four decades earlier. But, who is this person conducting a more real form of extraterrestrial communications and is the classic example of a serious vhfer? How did he become the one to arrive at a major milestone of this difficult radio challenge? Actually, Al is quite an ordinary family man. He has a wife, Sally, a five-year-old daughter, Alisha, and a dog, CQ. From their modest suburban home, he is chairman of the Engineering Technology Department at Trenton State College and she specializes in speech pathology. Always, Al has been a futurist and vhfer. At the age of 12, in 1956, he obtained his Novice license and operated exclusively with the then-available 2-meter privileges. The only time he listened to high frequency was for W1AW code practice so that he could upgrade. His bearded appearance and character are reminiscent of the late fifties. When most high schoolers and college types were digging the latest be bop dances, Al was experimenting with the latest vhf and up circuits. His interest focused on uhf and he began writing the “UHF Roundup” for The VHF Amateur. Later, in 1963, it was incorporated into CQ magazine. Some of the topics he covered included weak signal detection, amateur television, converters, transmitters, surplus equipment conversion, and of course, moonbounce. Before amateur involvement, the only other known moon relay circuit was operated by the U. S. Navy between Washington, DC and Hawaii. Their 400 megawatts of effective radiated power carried four multiplexed radioteletype channels. The first two-way amateur link took place between the Eimac Radio Club, W6HB, and the Rhododendron Swamp VHF Society, W1BU, on 1296 MHz in July, 1960. Only a few amateurs heard anything more than their own echoes over the following years. Nevertheless, Allen maintained an interest in that activity, comparing various means of long-distance vhf work on a balance sheet. Generally, for any communication over 500 miles at 432 MHz, moonbounce came out the winner over tropo for minimum loss. 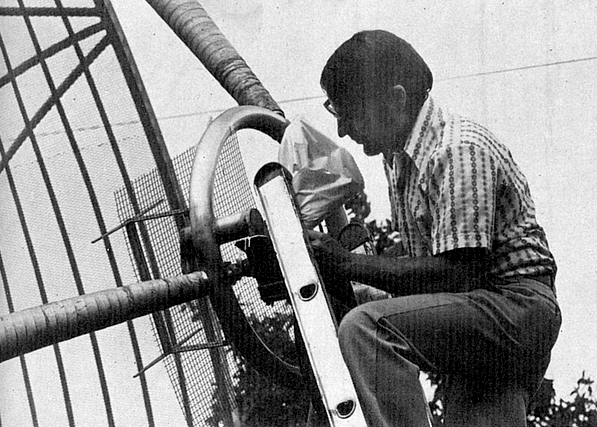 Amateurs at government and private institutions began conducting tests with other amateurs in the mid-sixties using very large arrays such as the 150-foot steerable dish at WA6LET or the 1000-foot dish amateur parabolic surface at KP4BPZ. A significant factor he saw was that not one amateur heard another on 432 MHz. “It was very discouraging . . . 1296 [MHz] is kind of like that now. 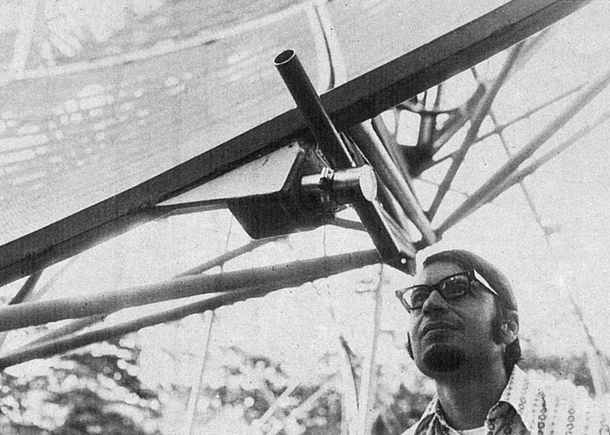 There is stuff around, but nobody really was making a concerted effort.” While still doing undergraduate work at Newark (New Jersey) College of Engineering, he built a 20-foot stressed wood parabolic dish and rented a place in the country. That subsided for lack of activity and a masters program at Rutgers. 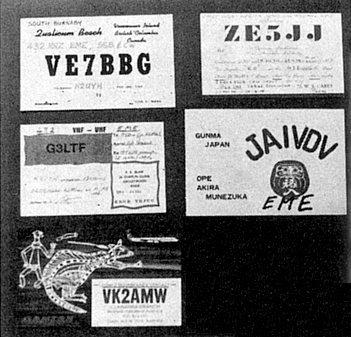 The catalyst that renewed his 432 EME interest came after VE7BBG worked WA6HXW in 1971. 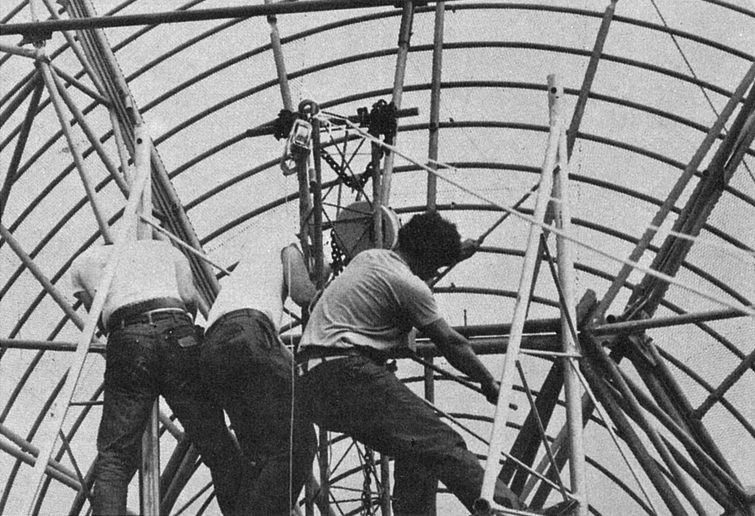 Immediately, he set out to rebuild the 20-foot dish and within a few months it was operational. 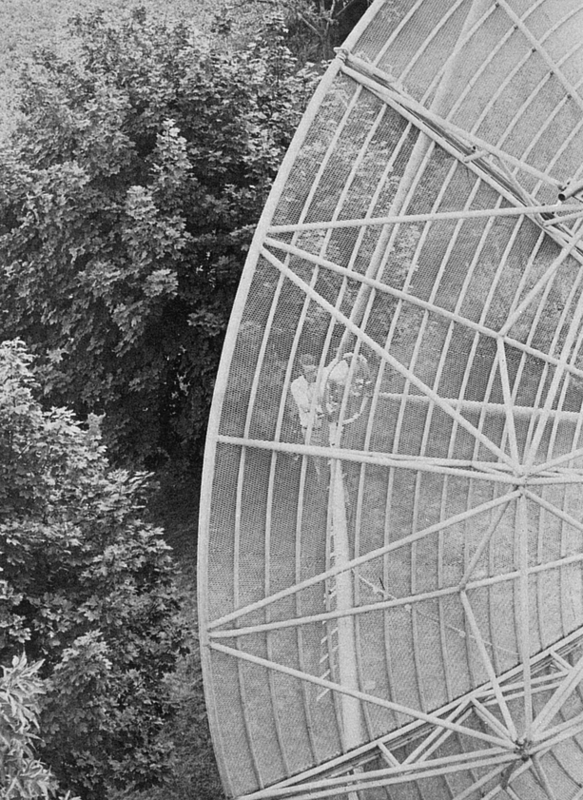 During the 1972-73 winter he obtained the surplus 28-foot dish that is his present antenna. In typical Pack Rat style he scrounged the supporting tower from the side of a road and made the mount in the college welding shop. It took until the summer to fully assemble, but the 28 dB of gain over an isotropic source made it worth the effort. For more than a year, he kept skedding ZE5JJ without success, but at an afternoon tea with some of the college students, the signal came out of the noise so loud that Al projected the station speaker to the backyard. They have worked other times since on simple QRZeds. About the only other station that has had any success with the Rhodesian is G3LTF. He feels that the key element for his success is the rotatable linear feed on his antenna. The dual dipoles and reflecting surface at the focal point of the dish can be rotated in the plane of the reflector. Faraday rotation is not as pronounced at 432 MHz as at 144 MHz, but the spinning of the signal as it travels is enough to place the received signal 21 dB or more down from a phased polarization with the antenna. Much like two single-sideband stations chasing each other across the band for voice clarity, EME stations have to be aware that changing the polarization for reception will affect the other station’s reception when the path is reversed. A high-gain antenna must be accurately aimed. With this dish the half-power beamwidth is 6°, about one click on a conventional rotator control. Al’s indicators read to within 1°. We said that Al is a vhfer, implying other phases of activity besides EME. Indeed, he does do other things in this world. On the same weekend as the Worked All Continents accomplishment he was at Trenton State participating in the antenna measuring contest. A loop Yagi he built for 1296 MHz measured more than 19 dB of gain. At the top of his 100-foot tower is an array of 16x 8 element Yagis for 432 MHz tropo. That has helped to bring his states total for that band to 34. Another vhf interest is the OSCAR program, mode B, of course, since it uses his favorite 432 MHz frequency for input. Vhfers have varying ideas about de fining a valid contact. because of the inherent weak signal work. He feels that an assertive policy is needed and looks back at the early meteor scatter days. Much was written about calls heard one way on a given; day and portions of calls were heard the other way on another day. After several days of such partials, could it be considered a complete contact? He, as most other moonbouncers, accepts the definition as an exchange of some unknown piece of information. They frequently use the T M O 5 system. After call signs have been established, the signal report, using one of those four characters, is sent at 3-4 words per minute as the unknown piece of information. The lowest report is T, indicating that something is there, like an SØ, M is the minimal report for copy of calls, and information, with an O there is some margin and long pieces of copy, and 5 can be used with an actual S report. The most major amateur cooperative effort that Allen has been a part of to date has been the HK1TL operation that made possible his 432 MHz WAC. Every month he publishes an EME newsletter sent to all known, participants around the world. As the plans developed he helped to coordinate the scheduling, for otherwise the bottom end of 432 MHz might have sounded like a 20-meter pileup. It was a logistical achievement for international relations and technology. Amateurs, officials and relatives in both the United States and Colombia volunteered countless amounts of time, skill and money to make the expedition a success. After missing K2UYH on the first attempt, the crew at the beachside location near Barranquilla physically held the huge portable antenna array to keep the sharp antenna corrected for windage and enable the first 432 MHz and moonbounce Worked All Continents to be done. The full details of the Pack Rats’ moonbounce expedition, however, is a story in itself. Al posts the certificate he achieved for the first Worked All Continents on a band above six meters. It truly represents the International Amateur Radio Union’s goal of promoting technical and operating performance through worldwide cooperation. It is more than a one-man show. Constructing such a large device requires the. cooperative effort of several fellow amateurs. Another classification we gave Al was that of futurist. For a pastime outside of amateur radio (!) he is a computer hobbyist. Microprocessor technology has advanced geometrically in the last few years to bring systems within reach of interested persons. Quite naturally radio amateurs have become attracted to the processes and applications, such as controlling the aiming for an EME antenna. Right now, he says, the computer hobbyist is like the early radio listener. He has a device that is a novelty, but in a transition period, he becomes, known as a hobbyist separate from the object. With some amateurs, like himself, the computer is still an adjunct to his primary interest of amateur radio. For others, like his friend, Doug Moser, WA2LTM, the involvement with microprocessors almost overtakes it. Al’s system is still up at his office, separate from his station. At Trenton State College, the program that he oversees is a bit different from a traditional engineering curriculum. He has placed emphasis on courses that will attract and involve persons like a typical ham. Because of amateur radio, someone may feel that the logical step would be an electrical engineering course, but is.. turned off by the theory and lack of laboratory classes available. As every ham knows by Murphy’s Law, theory and practice can be quite far apart. Thus, all classroom courses are matched as closely as possible to practical experience. The other integration that he foresees is the reciprocal - technical and theoretical people into amateur radio. He views the proposed Communicator class type of license as an ideal way to attract those who are oriented along amateur lines, but do not want the code. Progress toward a 432-MHz Worked All Continents by moonbounce: In his home continent of North America, Al was inspired to resume activity by the work of Cor Maas, VE7BBG. This card confirms a contact between them on November 12, 1973. Almost a month earlier, on October 13, he worked G3LTF for Europe. Until the HK1TL expedition P. K. Blair was the only other operator besides Al to have accumulated five continents. After the 28-foot dish was installed, one of the first contacts was with the Wireless Institute of Australia station at Illawara, VK2AMW. That contact of March 10, 1973, set a 432-MHz distance record of more than 10,000 miles and stood for over a year-and-a half. Only G3LTF had also worked the sole African representative, Peter Carey, ZE5JJ. Their two-way was done on April 5, 1974, after a year of fruitless scheduling. More stations, however, should be successful when Pete puts a 32-foot dish into operation this fall. Among the stronger signals out of Asia is Aki Munezuka, JA1VDV. He used a K2RlW-style 20-foot dish for their contact of March 27, 1975. No card was available at press time for Al’s historic contact with the last continent in the International Amateur Radio Union, South America. On July 29, 1976, however, HK1TL completed two-way communication with K2UYH for the first 432-MHz Worked All Continents. Another FCC proposal that he has thoughts about is the bandwidth docket. In his primary band of 420-450 MHz much antagonism has arisen between users of wide-band fast-scan television and narrow-band weak-signal operators, like EMEers, over a band plan and value judgments of the different modes. Docket 20777 would eliminate fast-scan television from that band, but Al favors the League’s, counterproposal of placing ATV on fixed channels for five years, then reevaluating the situation. Having worked both sides as an operator, he sees viable development of each in the spirit of amateur radio. With a workable band plan, he feels, all amateurs’ specialties can continue to coexist through their unique ability to self-policing and cooperation. What next? Worked All States is a definite possibility and perhaps DX Century Club. Already, 14 countries are in the K2UYH log. 1 Katz, “UHF Roundup,” The VHF Amateur August, 1963. 2 Katz, “Simple Parabolic Antenna Design", CQ, August, 1966. Moonbounce work demands that all gear operate perfectly. This holds even more so when the operation is a portable expedition to another continent. The Pack Rats did it! Pelicans swoop the shoreline as twilight approaches. An environmental engineer, a pharmacist, a motorcycle mechanic, and others occupy a beach house. They could be enjoying a cool drink after another warm summer day at the resort. Instead, they are celebrating, with their own special brew, the success of an effort that brought them together in that isolated spot the first moon-bounce expedition to South America - HK1TL. Last month we reported that. 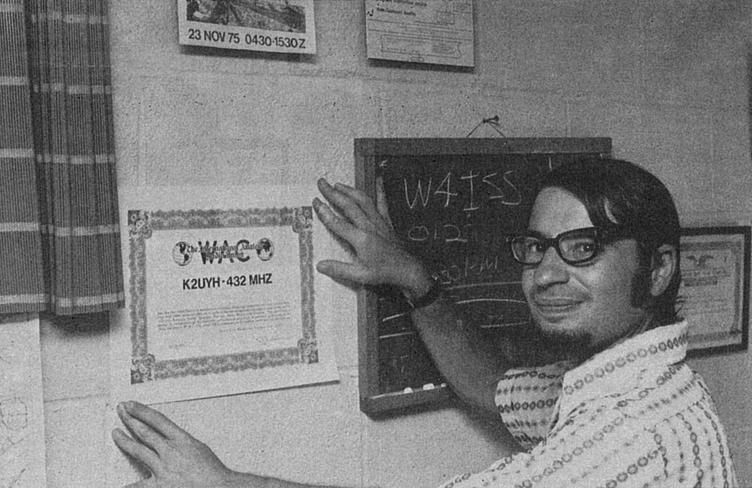 Allen Katz, K2UYH, completed the first Worked All Continents on 432 MHz and moon bounce by working that last continent, so obviously another station had to be on the other end of the two-way circuit. It was the Mt. 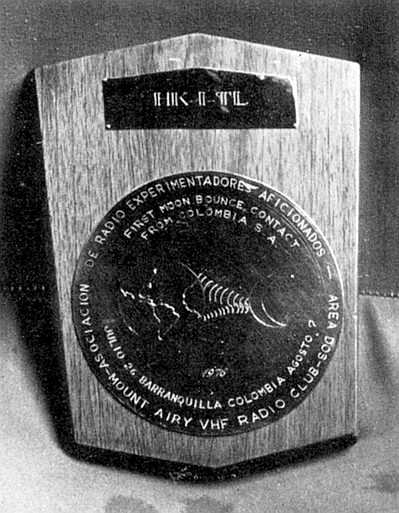 Airy VHF Club, of which Al is a member, that mounted the expedition to provide South America's first 432 operation. 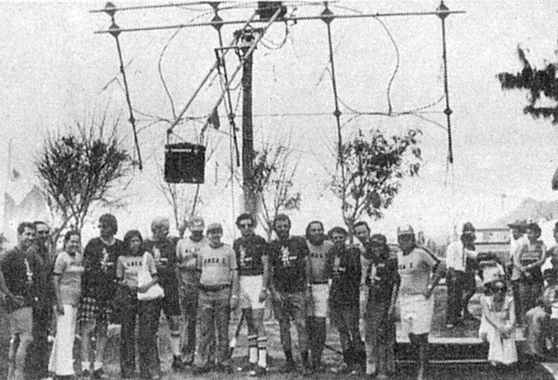 From the club‘s home in Philadelphia, Pennsylvania, five of the club ‘s 82 members journeyed to Barranquilla, Colombia, for successful contact with 16 different EME (earth-moon-earth) stations and approximately 75 OSCAR Mode B stations, as well as to make new ties and stimulate amateur radio interest with the people there. Individuals and organizations in both the United States and Colombia contributed vast quantities of time and funds to make the operation a success. In 1956, a group of Philadelphia amateurs organized to actively promote serious vhf/uhf work. To characterize their aversion to commercially built equipment they adopted the nickname of “Pack Rats.” Instead they always favor experimentation with home-built gear. An inspection of any member’s garage or shack will reveal a wealth of parts and surplus gear acquired by trading. Over the ensuing years they have designed, and built converters, receivers, transmitters, amplifiers and antennas for virtually all amateur vhf bands. Their activity takes different forms. During the ARRL January VHF Sweep stakes plus the June and September QSO Parties, they put their latest creations to the real test. Consistently, they have topped the competition. Any active club, of course, operates a net. The Pack Rats have not one, but five nets every Monday evening on all bands from 50 MHz through 1296 MHz and the ATVers (amateur television) con duct yet another net on Friday nights. Their real pride and joy, however, is the W3CCX/3 moonbounce system located in Revere, about 25 miles north of Philadelphia. On the farm owned by Pack Rat member Walt Bohlman, K3BPP, the club station is one of the most successful on the air, particularly after the addition of a 20-foot stressed parabolic dish in the 1972-73 winter. Alter they made their first complete contact with the Stanford Research Institute group, WA6LET, they celebrated with a cup of Red Zinger tea, a Pack Rat success trademark ever since. At the monthly meetings a report would be given about the latest activity. More and more new stations were noted from various states, countries and continents - except South America. Immediately, Elliott presented the Colombians’ operating site offer to the club’s board of directors. They liked it and appointed him as coordinator. The red tape began. To make an official request from the Colombian government, all correspondence must be on official paper carrying a tax stamp. Price from the consulate: $2 per sheet. Be sides designing the request letter to detail all the operating and technical requirements, an additional task was to translate it into Spanish. Several letter exchanges followed and to avoid paying duties upon entry, a list of the equipment had to be provided. Back to the consulate for more paper. A problem arose because they were still in the process of assembling the station. Obviously, a whole new station had to be put together since they wanted W3CCX to work the expedition. That was resolved. Soon after the work started, the planning committee became aware that another coordinator would be needed in Colombia, so Socrates suggested Dr. Atenogenes Blanco, HK1BYM. He enlisted the aid of the Barranquffla Area 2 Radio Club who later provided invaluable service to the expedition. “We gave the guys building the stuff the outside dimensions and told them, ‘that’s how big you can make the thing." Once more the Pack Rat philosophy prevailed. Tony Souza, W3HMU, built a complete 432-MHz kilowatt amplifier from scrounged parts, save for a $1.25 part. Even the 8938 final tube came from the endless junk box. Other primary pieces of equipment that were produced specially for the expedition included a power supply by Bill Olson, W3HQT, and the exciter by Walt Bohlman. That used a 4X150 to a 4CX250 driver. The most outstanding engineering feat had to be the antenna. Their 20- foot dish could not very well be taken down or even duplicated for air freight shipment. Instead, Walt, who designs antennas by profession, devised a system using 16, K2RIW-style 13-element Yagis so that everything could fit into six-foot crates. Besides the necessary azimuth and elevation rotation, the antenna had a third axis for polarization compensation. Indeed, the moon itself had a large influence on the actual scheduling. Between perigee and apogee each month the path loss for the EME path varies by 2 dB - enough to mask a signal or bring it out of the noise. Other factors to consider were proximity to the sun and optimum window time for the other stations around the world. Cor Maas, VE7BBG, coordinated those schedules. Only after those considerations could they think about their convenience. They selected the last weekend in July. More logistics problems crept in during the meantime. Shortly before the scheduled departure for the main group, Socrates’ XYL, Rose Alva Martinez, went home to Colombia early to purchase the airline tickets. Although Aerocondor had given a discount, inflation crept in. Sheila Nassar, HK1CWD, however, made up the difference. The customs paperwork had not been entirely settled, so Dr. Blanco made a trip to Bogota, capital of the country, for further negotiations. The Pack Rats moonbounce team gather with their Area 2 Radio Club hosts underneath the 208-element antenna for 432 MHz. It actually measured one dB of gain better than their 20- foot dish at the home station in Revere, PA.
At last, all was loaded for the trip down. At Miami International another friend stepped into the picture. Russ Wicker, W4ZXI and a fellow moon-bouncer, works there and made arrangements for the equipment to get on the same flight as the crew. All did travel on the same flight. A couple of boxes had some damage, but that was the least of their worries. After two-and-one-half hours with customs officials, the gear was cleared only after Dr. Blanco posted a $3000 bond assuring that all the equipment would be removed from the country after the specified stay. Many of the crew had been working with the Atlantic Division convention to give a seminar on July 25, the same day of their departure When they did arrive in Barranquilla the following day, they had a long press conference with the local media. The actual site was located in the town of Santa Veronica, about an hour-and-a-half ride from Barranquilla, with the local civil defense providing a truck and driver for the 1368 pounds of equipment plus crew. On Tuesday, July 27, they set up the 20-meter link and the first message from W3KKN, their liaison back home, was that they had received permission from AMSAT to operate Mode B on Wednesday. Originally, they had not planned to take any OSCAR gear, but the organization had been alerted and provided the gear. The first OSCAR and Mode B contacts were made that Wednesday while setting up the moonbounce station. At last the big day, July 29, came. “When we patched everything together and plugged it in the first time - it worked!” Bill Olson said of that first day. At near-vertical elevations the antenna had wind-loading problems and the first schedule with K2UYH was missed as was the one with F9FT. Finally, during the 1800 UTC schedule a two-way was completed with K2UYH followed by W3CCX. Another conference was held that evening with the Area 2 Radio Club, potential amateurs and c.d. officials. The Pack Rats showed Ham’s Wide World, slides of their outings and gave more talks until midnight. Then, the hosts celebrated past 2 AM. Nevertheless, the crew made the hour-and-a-half trip back to Santa Veronica for a couple of hours sleep before a 6 A.M. OSCAR pass. Most of the following days were like that - 12 hours or more of moon schedules and OSCAR passes. A constant problem, however, was power failure. The first major occurrence was Friday afternoon from 2:30 P.M. until 6 P.M. because trees were being trimmed. After it was restored, the voltage measured only 95 volts forcing cancellation of almost all schedules that day. During the remaining days that weekend, power fluctuation continued to be a problem. But always, the Area 2 Radio Club would set out to find the source of the problem and more than once brought in emergency generators. Enough power was usually available to operate the 20-meter liaison. That was one of the prime factors that allowed successful rescheduling over the weekend. Ernie Kenas, W3KKN and his XYL, Bertha, W3TMP, provided that link every day of the operation. All the way through, cooperation and coordination allowed everything to work out. Among those who helped defray the approximately $9000 in expenses were Collins Radio, Mt. Airy VHF Club, Northern California DX Foundation and an anonymous Pack Rat member. Another less apparent, but very important person was Rose Alva Martinez who did all the cooking for the crew during their nine-day stay. Before departing, both the Mt. Airy VHF Club and the Barranquilla Area 2 Radio Club reached a mutual understanding that they would not lose contact with each other after the project was over. Of course, it would have been unrealistic to expect all to have go perfectly. But, as Weisman said, “It was probably better that we had the problems because I don’t think that would have had as close a relationship with the people down there as if we didn’t have any problems.” Thus, radio amateurs have once again demonstrated that their unique form of international goodwill can cross all boundaries to create a common success.